Shakin & Bakin Foodie Blog: Delicious Cocktail Drink Recipes to Try Out This Spring! Delicious Cocktail Drink Recipes to Try Out This Spring! Voli Light Vodka is the world's first low calorie fruit and fusion flavored vodka. Voli Light Vodkas are on average 25 to 40 percent lower in calories than leading brands. Voli Light Vodka's natural ingredients achieve the perfect balance of natural fruit flavors and vodka distilled from superior French wheat and pure spring water. Prepare for Spring with these delicious Spring-themed Voli Cocktails! Light and refreshing, they will get you in the mood for Spring! Glass: Rocks. 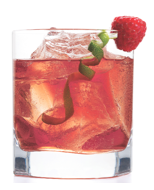 Garnish: Raspberry and lime twist. APPROX CALORIES: 130. Disclaimer: You must be age 21 years or older to consumer alcoholic beverages. These recipes were given to us by a PR firm to share with all of our foodie blog readers.